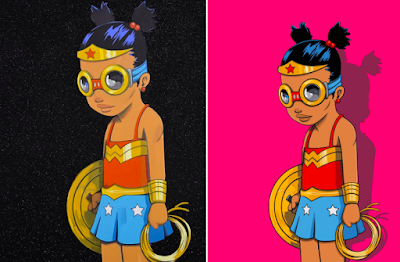 Check out Hebru Brantley’s newest comic book inspired screen print, “Wonder”! This exciting new print features one of Hebru’s signature characters, Lil Mama, dressed up as the DC Comics’ Wonder Woman. Does Lil Mama look fierce as an Amazon Princess or what!?! Released in conjunction with Avenue des Arts Gallery in Hong Kong as part of Brantley’s solo show “Lord of the Flys”, a limited number of prints were also made available at the Hebru Brand Store. Wonder by Hebru Brantley is a 22”x30” signed and numbered Wonder Woman screen print on Mohawk Superfine UltraWhite 160 lb cover paper with deckled edges. The black Regular Edition ($450) is an 18 color screen print limited to 120 pieces, while the pink Variant Edition ($550) is a 19 color screen print limited to just 20 pieces. Sadly, both editions are now sold out.